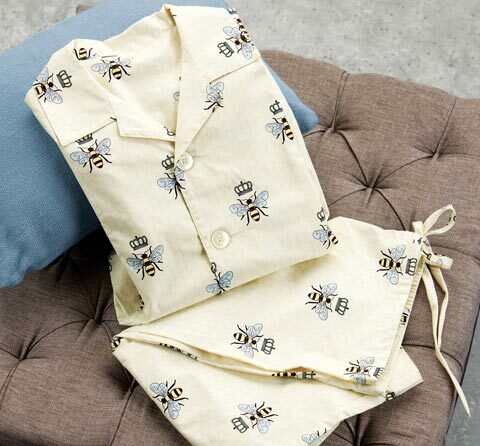 A set of posh pajamas fit for Queen Bee herself! Made from the softest 100% cotton with regal crown and honeybee patterning on a buttercup yellow background, pajamas feature a long sleeved button down shirt and comfortable full-length pants with drawstring and elastic waistband. 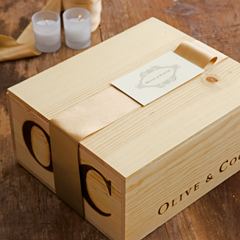 Available in women’s sizes small, medium, and large, pajamas come gift wrapped in a hand crafted wood crate with ribbon. Queen Bee Pajamas is rated 4.8 out of 5 by 15. Rated 5 out of 5 by Wendy R from Queen Bee I purchased the robe and pajamas as a Christmas gift for my sister and she loves them. Rated 5 out of 5 by Patrick from Awesome, awesome, & awesome OMG,SIMPLY THE SMARTEST PURCHASE I COULD HAVE EVER MADE.Sally my wife was so impressed, packaging and the quality just blew her away. Rated 5 out of 5 by ChrisD from Beautiful! I love these pajamas! The are so beautiful, soft and comfortable. Also great quality. I would highly recommend them. Rated 5 out of 5 by Swoods26 from Beautiful PJs I bought these PJs for my mom for Mothers Day - she loves them. Rated 5 out of 5 by MaryCatherine from Its the bees knees! Bought these for my niece's birthday who is a bee keeper. She called me right away to tell me about the fabulous gift box and then how soft and lovely the pajamas were. 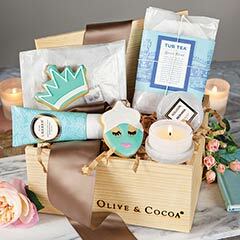 Thanks Olive & Cocoa! Rated 5 out of 5 by PJam from Comfy and cozy! Purchased as s gift. Recipient loves! She will wear all winter and into Spring. Soft. Well made. Rated 5 out of 5 by Stephen from For the Queen Bee Excellent product. My wife is totally in love with these. Highly recommend these. Soft, comfortable for my Queen Bee.